This station activity is perfect for a farm-themed My Obstacle Course. 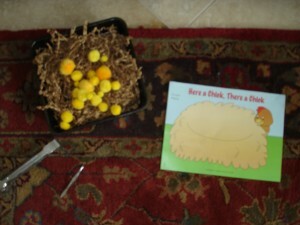 All you need are some colored puffs (yellow works great for baby chicks) and some tweezers or ice tongs. I had some brown shredded paper that I placed into a baking pan because I thought it would help in pretending that they were still in their nest. I also had a picture of a hen from a Mailbox Teacher Magazine but you could draw your own (you would laugh if you saw what mine would look like) or simply print one from of the internet. Using the tweezers or tongs helps to build hand muscles necessary for handwriting and even eating with utensils. Here is a past post that I did on tweezers.